On March 16th most churches will celebrate Palm Sunday, the Sunday before Easter. This event, also known as “the Triumphal Entry,” involves one of the most astonishing passages in the entire Bible. After his conquest of the Babylonian Empire, Alexander the Great promoted the Greek language throughout the known world, and thus almost everyone-including the Jews-spoke Greek. Hebrew fell into disuse, being reserved primarily for ceremonial purposes (somewhat analogous to the use of Latin among Roman Catholics). The Book of Daniel is actually one of the most authenticated books of the Old Testament, historically and archaeologically, but this is a convenient short cut for our purposes here. It is critical to realize that the Book of Daniel existed in documented form almost three centuries before Christ was born. Seventy weeks are determined upon thy people and upon thy holy city, to finish the transgression, and to make an end of sins, and to make reconciliation for iniquity, and to bring in everlasting righteousness, and to seal up the vision and prophecy, and to anoint the most Holy Place. This includes a mathematical prophecy. As we have noted in previous studies, the Jewish (and Babylonian) calendars used a 360-day year;4 69 weeks of 360-day years totals 173,880 days. Whenever we might easily miss the significance of what was going on, the Pharisees come to our rescue. They felt that the overzealous crowd was blaspheming, proclaiming Jesus as the Messiah the King.8 However, Jesus endorsed it! There is a remaining seven-year period to be fulfilled. This period is the most documented period in the entire Bible. The Book of Revelation, Chapters 6 through 19, is essentially a detailing of that climactic period. The interval between the 69th and 70th week continues, but it is increasingly apparent that it may soon be over. 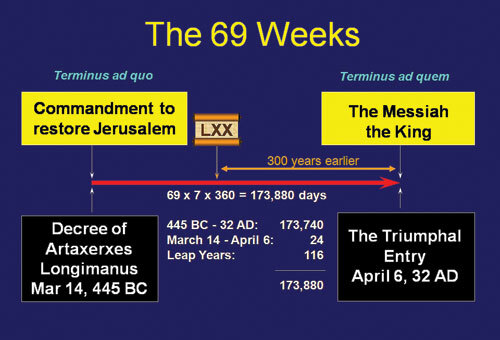 The more one is familiar with the numerous climactic themes of “end-time” prophecy, the more it seems that Daniel’s 70th Week is on our horizon. Have you done your homework? Are you and your family prepared? As you celebrate Palm Sunday this month, share with your family and friends this incredible demonstration of just who Jesus really was-and is-and what the significance of all this is to all of us! For a more complete exposition of this amazing passage, see our briefing package, Daniel’s 70 Weeks. For more on what really happened at Easter, see our briefing package, The Easter Story. Anderson, Robert, The Coming Prince, Hodder & Stoughton, London, 1894. The classic work on the Seventy Weeks of Daniel. 1. Encyclopedia Britannica, Volume 10, p. 642. 2. Leviticus 25:1-22; 26:3-35; Deuteronomy 15. 4. Genesis 7:24; 8:3,4; Revelation 11:2; 12:6; 13:3,4; etc. 5. First identified in Sir Robert Anderson’s classic work, The Coming Prince, first published in 1894. Now available in any Christian bookstore. 6. John 6:15. Always in control: John 7:30, 44; 8:59; 10:39. 9. Luke 3:1. Tiberias appointed in 14 a.d.; 15th year, 29 a.d.; the fourth Passover occurred in 32 a.d.